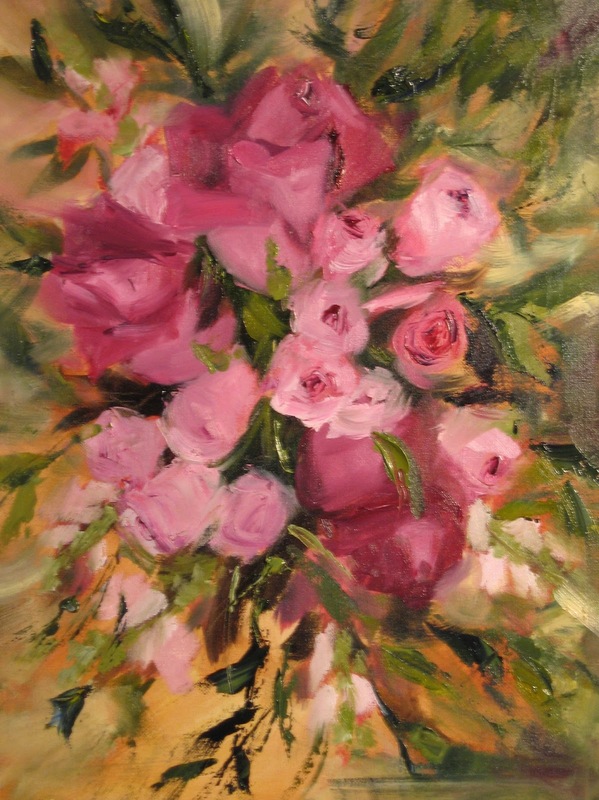 This is the latest in my series of flowers paintings. Decided to try another one that combines flowers and some background landscape. 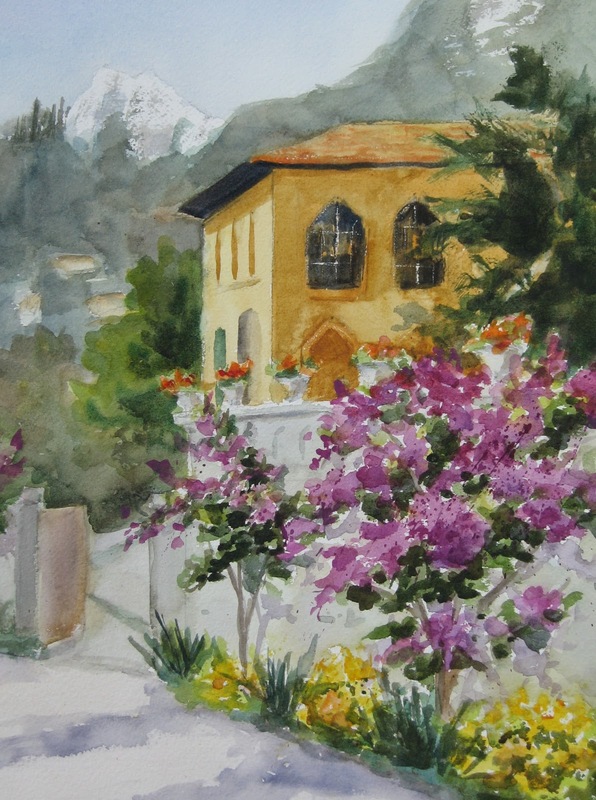 This is from a reference photo I had from the workshop I taught in Tuscany this past spring. The flowers on the table were so pretty. They were grown in the garden of the place we were staying. I brought them out on the balcony to shoot them in natural sunlight with the beautiful Tuscan countryside in the distance. 10 Minute Challenge "Strawberry x 4"
Today I took on a "challenge" sponsored by Daily Paintworks. 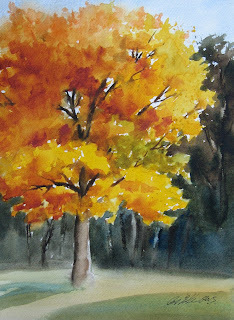 The challenge was to set a timer and paint one object in 10 minutes. Then do it again, for a total of 4 times. I picked a strawberry . 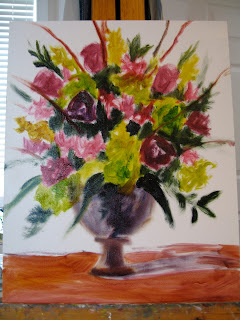 It was more fun and less daunting then I might have thought to keep your painting time to 10 minutes. It does force you to be selective and only get in what's most important. Could be a good warm up exercise on a regular basis. To see other paintings I have listed, click on DailyPaintWorks gallery . After my recent trip to Italy, I decided to include a little landscape setting as backdrop to this recent flower study. 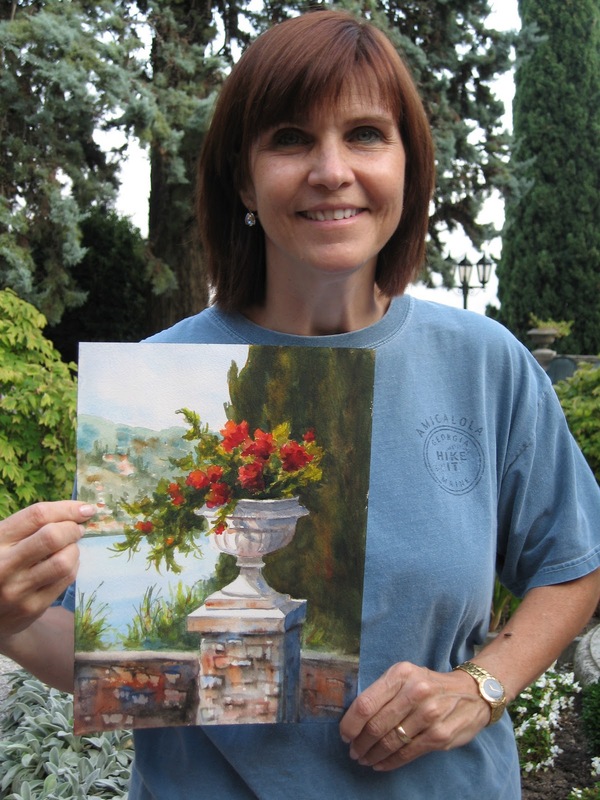 This is an oil version of one of the paintings I did while teaching a workshop at Lake Garda in Northern Italy in late Sept. 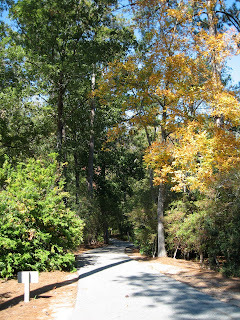 Yesterday, I taught a workshop at Callaway Gardens in Pine Mountain, GA with a focus on Painting Fall Trees. Above is a quick watercolor demo I did for the class. the colors werent' quite at peak yet, but there were still some fun fall colors to paint. 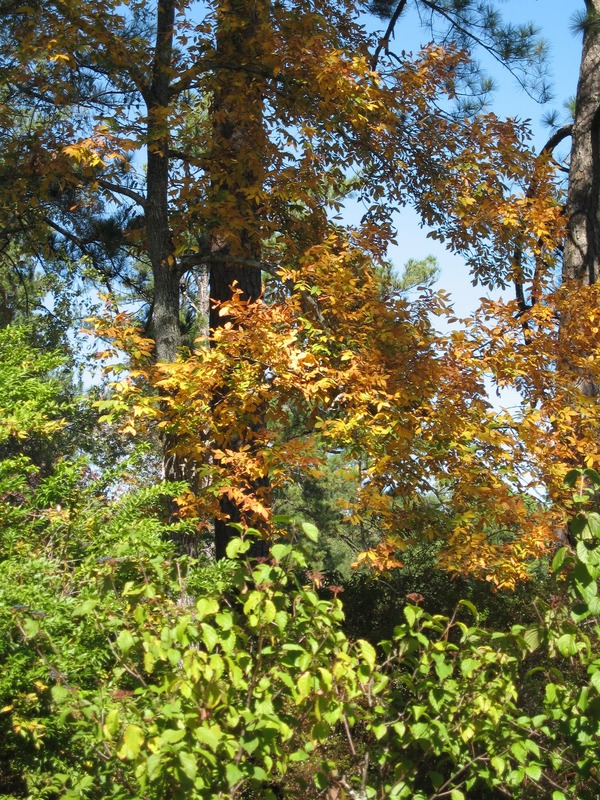 Below are some photo's of trees, one of my students painting and some bright autumn mums that might be a fun future painting. 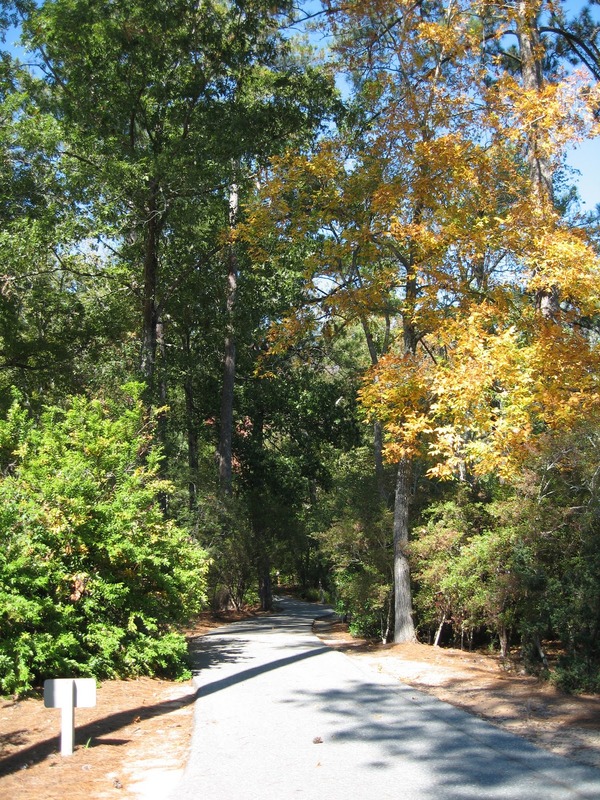 it started out a bit cold, but turned into a beautiful day to be outdoors inspired by nature. I had done a painting a few days ago of one of my floral arrangements from my flower design class. After looking at it on screen, I realized that I had really reduced the size of the lilies and it had lost something in the translation. ( See flower study #40). So I decided to give it another go. Instead of using the exact same arrangement, I used another similar arrangement which is pictured below. The flowers are long gone, but I did have a photo. The colors in the photo appeared much yellower than I liked, so I made some adjustments to tone it down. I'm glad I decided to do it again, I'm much happier with the painting the 2nd time around. 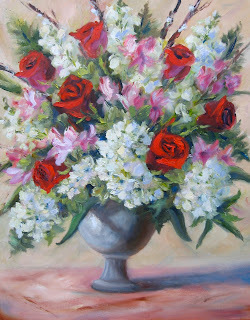 To see others in my floral series or to buy paintings on line visit Daily Paint Works. Decided to take a break from the flower studies for a day and did one of the still life lessons from an on line study program I have been doing this year with Dan Edmonson. In his program, Dan supplies the photo's of some great still life set ups along with an on line video( and permanent copy on CD) . 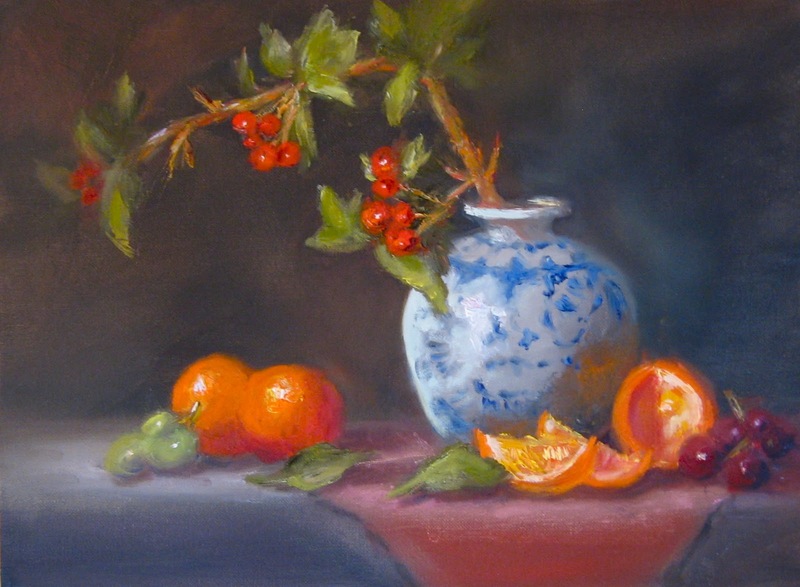 There are 10 lessons in his still life series and he also has a similar landscape series available. The lessons build on each other and get progressively more challenging. This was number 8 of the series of 10 and it was definitely challenging. In hindsight, I wished I had done it on a bigger canvas. 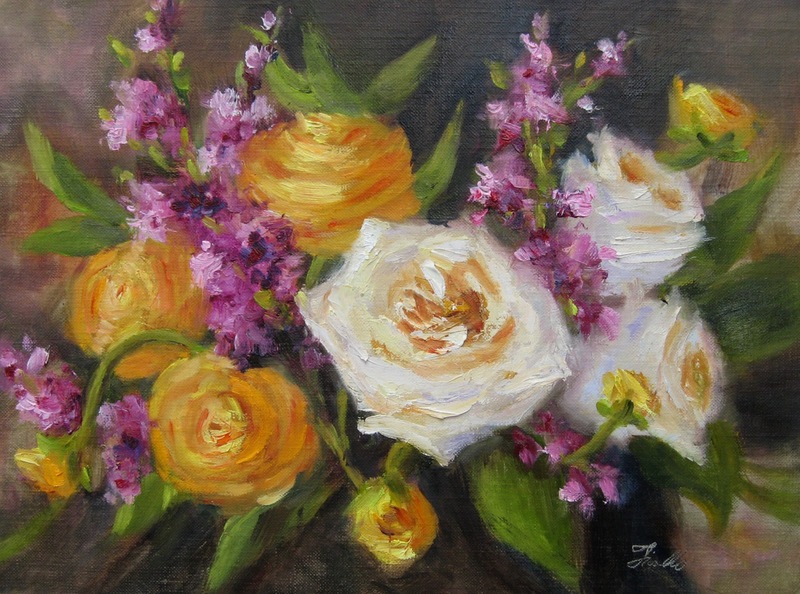 I could have used larger brushstrokes in describing each of the elements since there is a lot going on on this small canvas. 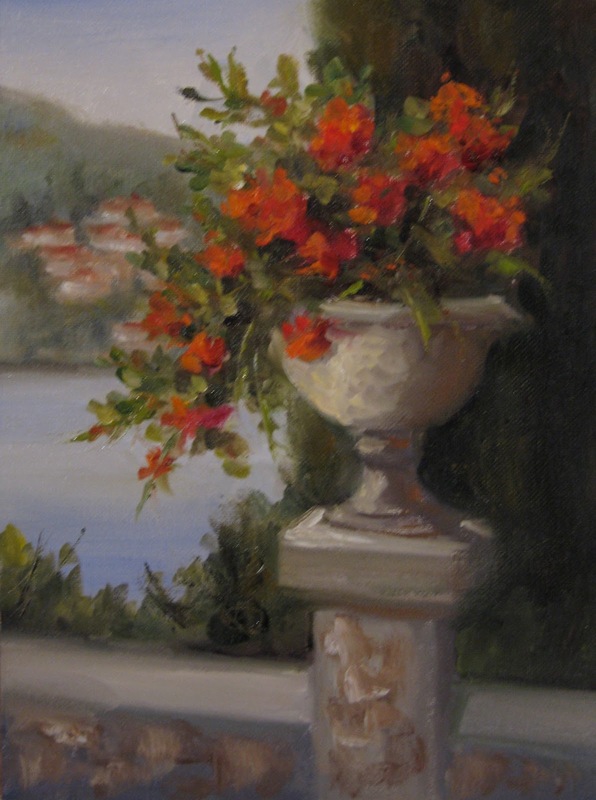 These classical dark style still lives are probably not my personal style, but they have been great training. Dan is an excellent and generous instructor who consistently provides spot on feedback. I have really enjoyed and learned a lot from his instruction and would highly recommend you check his programs out. For this painting, I focused on trying to get a looser feel, with a bit more movement. 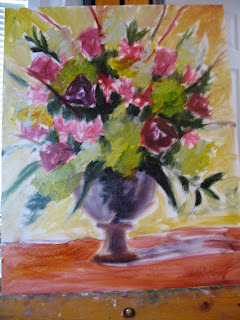 I did more of a close up vignette rather than a full still life or painting including a vase. Kept the background simple, with some of the toned canvas visible. Plan to do more in this direction, continuing to contrast hard vs soft edges. 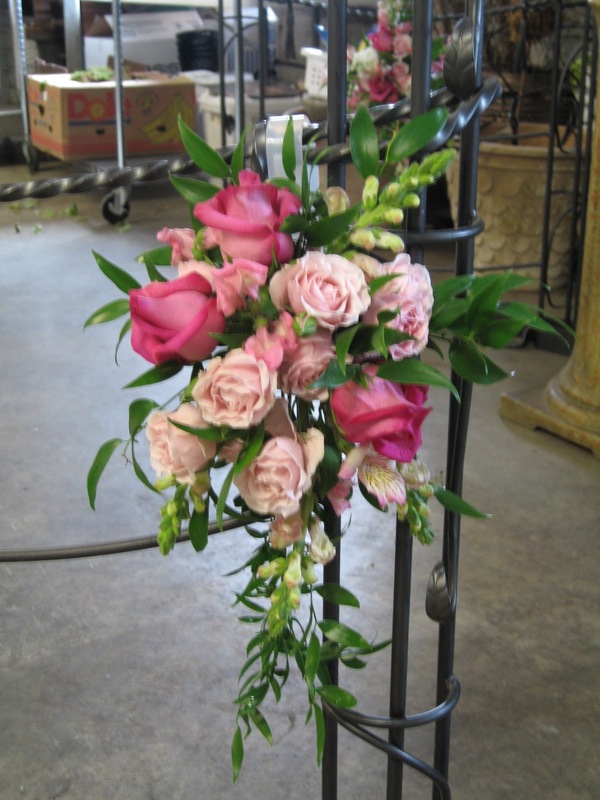 If you read my last blog, you saw the flowers we put together the last day of flower design class to simulate what might be needed for a wedding. This was one of the large altar pieces that I arranged. It was very large, so when I brought it home, I tried it out on a larger canvas than most of my other studies. I had an arrangement of flowers that was an unusual project in my flower design class. 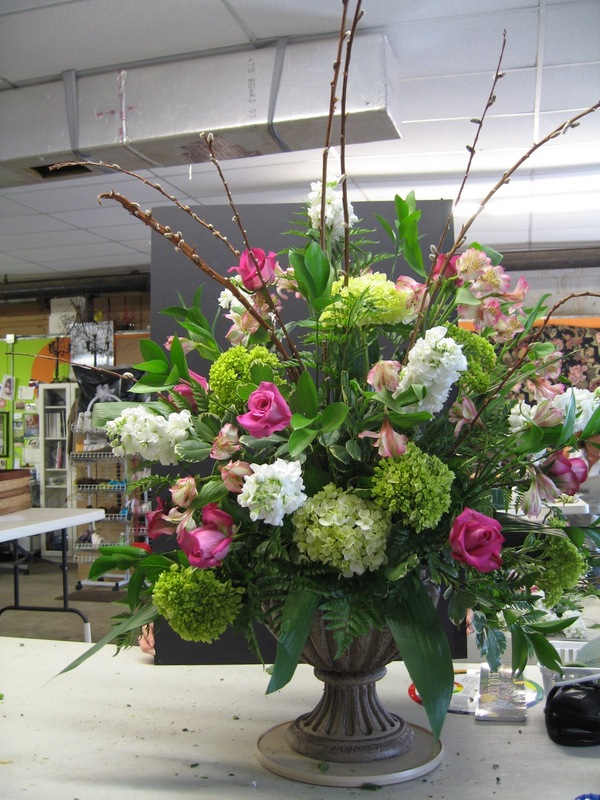 The last day of class we did flowers for a wedding. 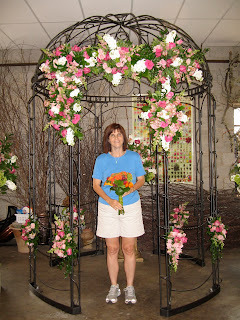 The full deal- bouquets, altar flowers, even flowers to decorate a gazebo which we had set up in the classroom. We also made" pew markers" -flowers that go on the aisle in a church for a wedding. 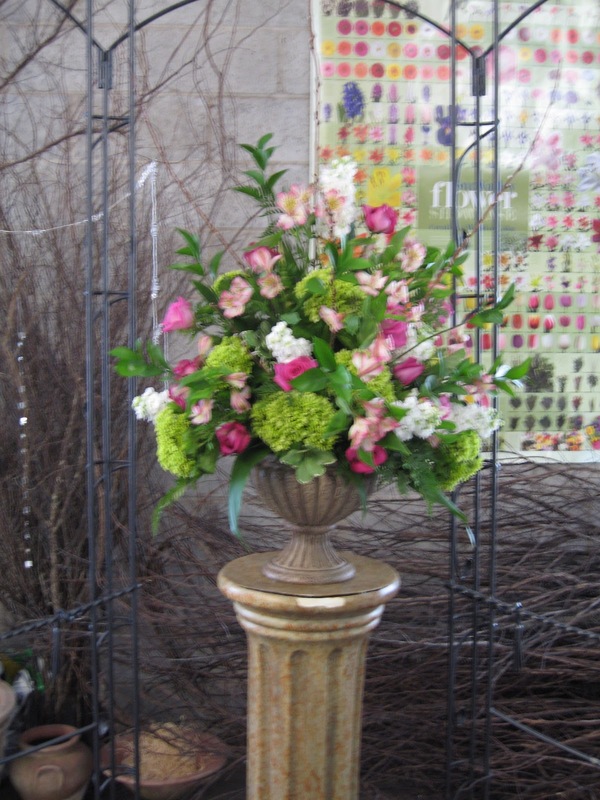 The arrangement was one sided so that it could flatly rest against the side of a pew. 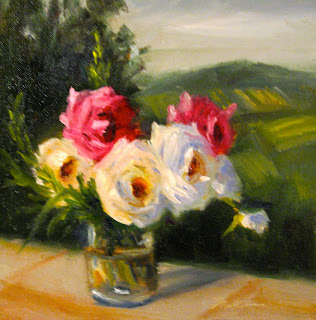 I liked the color harmonies of subtle pinks and off whites, so I decided to do a study of this flower grouping. Th nature of it was flowing, so I decided to use this as an opportunity to try to keep it really loose and capture a feeling of energy and movement. 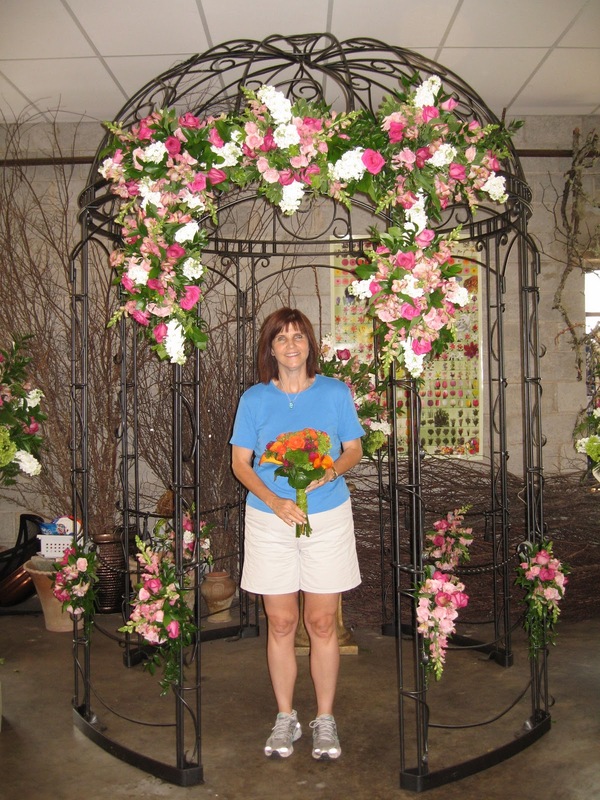 Here is the photo of the inspiration, as well as some other fun photo's from our last day of class creating the wedding flower arrangements. 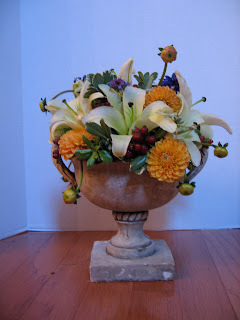 I'm working on a larger painting of the larger altar piece in the urn and will post that later this week. This is another in the series based on floral arrangements I did in floral design school. 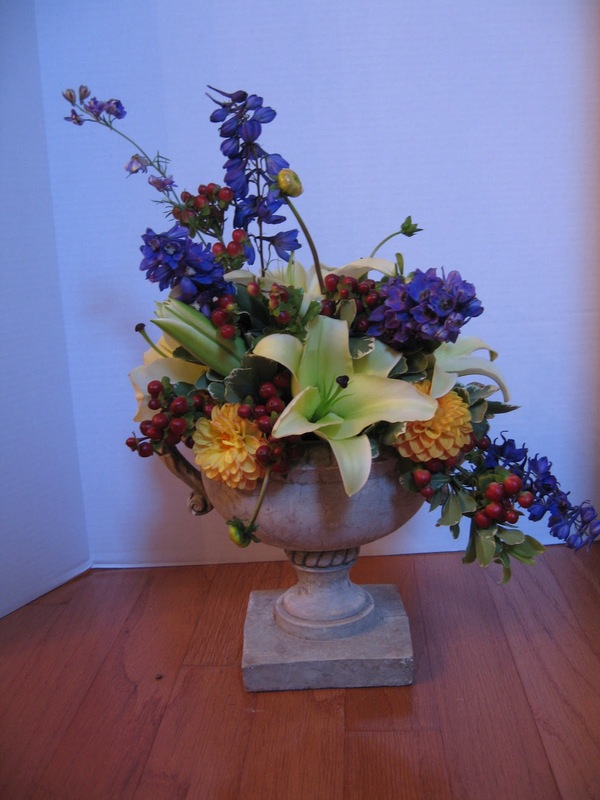 I'm not too wild about lilies ( compared to some of my other favorite flowers like roses, hydrangeas, delphinium etc..) and the lilies seemed pretty big in the real arrangement, so I made them smaller in the painted version. I do think it lost something in translation so this may be one to try over. 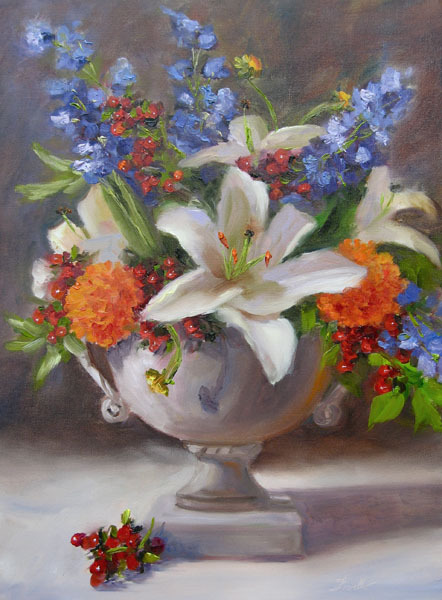 I just happened to watch the Daniel Keys video on painting lilies yesterday and after seeing that may have some new approaches on handling the big lily. This was the symmetrical version of this arrangement, but there is also an asymmetrical oen that might be a bit more dynamic composition for painting. 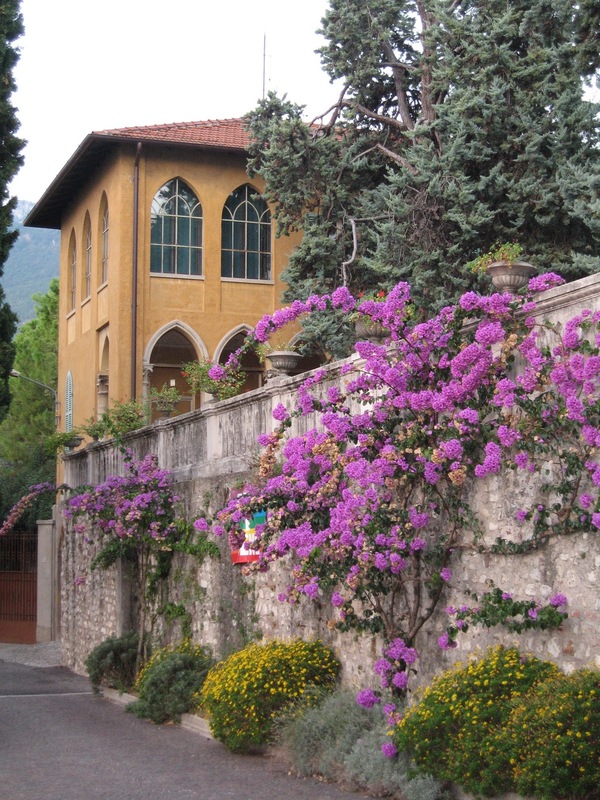 I just returned home from teaching a workshop in Northern italy. I had a group of 12 students from various places in the US with me. 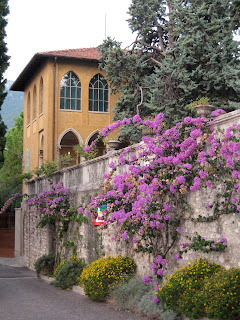 We met in Milan and spent a couple of days there, then spent the rest of the week in a small town on Lake Garda. Below is a demonstration painting I did the first day of the cloistered monastery where we stayed. Here are some other photo's from the workshop. I just got back from teaching a painting workshop in beautiful Lake Garda, Italy. Will share more about that later this week, but still have a few flower studies from my flower design program that I wanted to share. 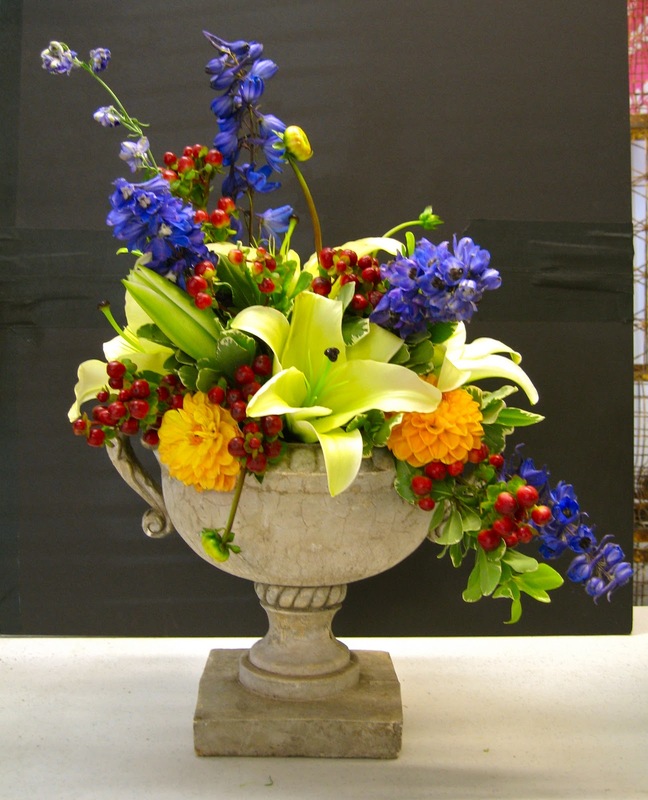 This one is from a design we did which is called a Della Robbia- an arrangement that includes fruit and flowers. Here we included apples, limes and kiwi in the arrangement in addition to the orchids and roses. The colors in the painting were a little hard to photograph and adjust quite right, but it has a more subtle neutral cool grey background than is probably showing up on the computer monitor. The actual arrangement is pictured below at my work station in the floral design studio.